The World Wide Web of 2013 provides online retailers with a variety of options for reaching customers – from social networks to digital advertisements. Yet one tool tends to outperform the rest – email. In fact, a recent study from marketing automation platform provider Eloqua found that email still drives more traffic than social media, which is likely because email provides a direct line of communication between businesses and consumers. Moreover, the most successful email campaigns are personalized and targeted so that messages not only grab attention, but are also relevant to each recipient. That being said, you can learn a lot about a company from their email campaign. For example, an initial “welcome” email means that a company takes customer acquisition very seriously and is trying to foster a relationship with consumers, while a retargeting message that features items from an abandoned cart shows that the company is taking every step necessary to avoid a lost sale. Luckily, merchants can learn from the email campaigns of other online retailers without filling up their inbox, because Website Magazine conducted an in-house experiment to analyze the email strategies of 10 retailers on the ’Net. The first installment of E-Commerce Emails will take a look at the tactics merchants use to welcome their customers, while Part 2 will analyze how merchants guide consumers through the purchasing cycle via email. EDITORS NOTE: Website Magazine decided to analyze the email campaigns of online shoe retailers for this experiment. However, regardless of the type of items your e-commerce store sells, there are still many takeaways that can be gleaned from these merchants’ email strategies. 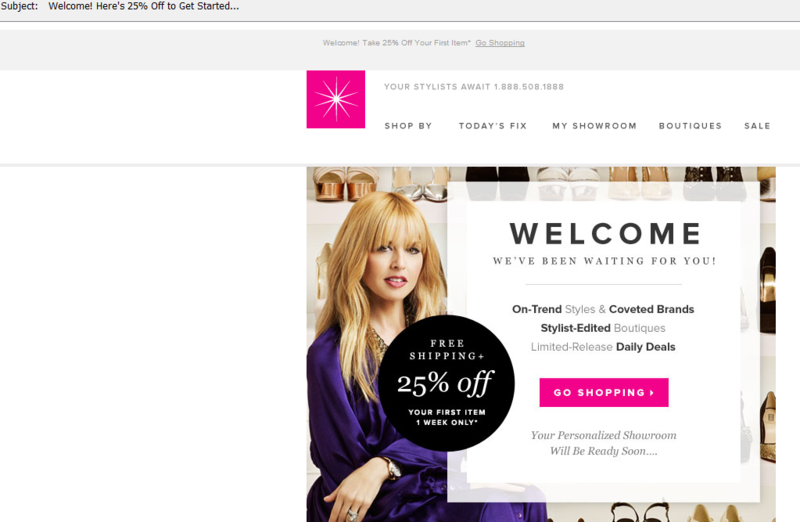 Only 80 percent of the targeted retailers for this experiment actually sent out welcome emails. Here is the list of the targeted retailers: DSW, Zappos, Macy's, Toms, Skechers, ShoeDazzle, JCPenney, Steve Madden, Overstock and JustFab. 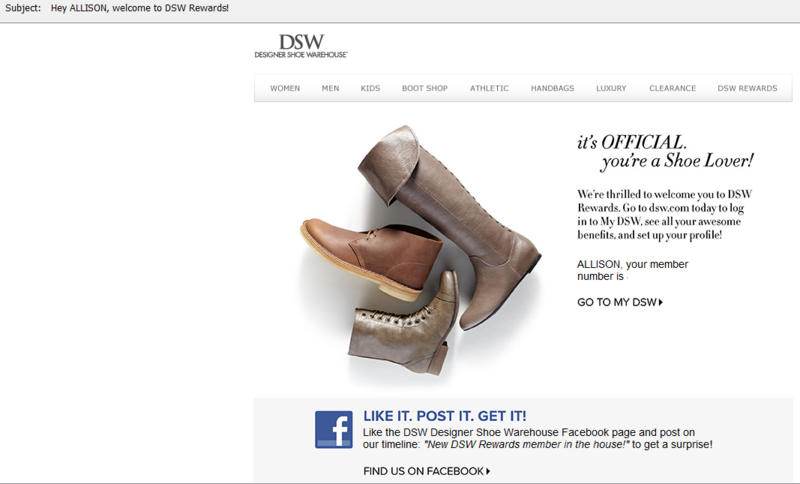 DSW not only personalizes the subject line and message by using my first name, but also adds social elements by offering an incentive for me to “like” the company on Facebook. 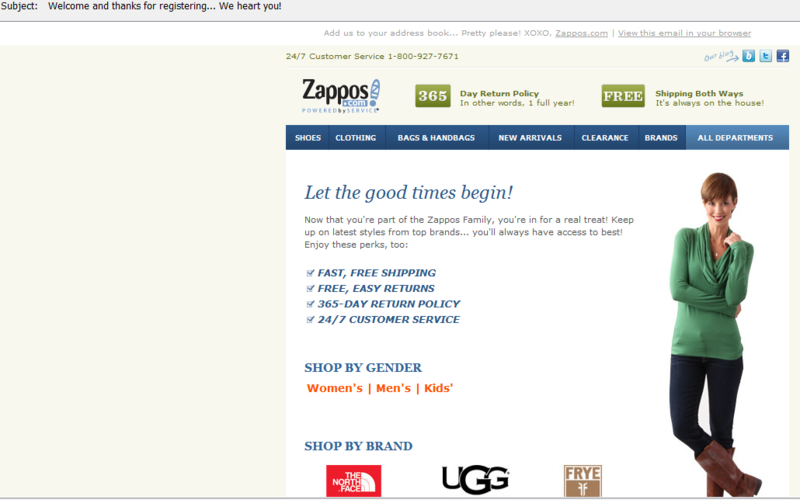 While Zappos didn’t personalize this message, the company does welcome me as part of the “family” and highlights its outstanding return and shipping policy at the top of the message. Additionally, Zappos uses a smart strategy by asking recipients to add the company to their address book at the top of the message, because this will ensure that future messages aren’t marked as spam. 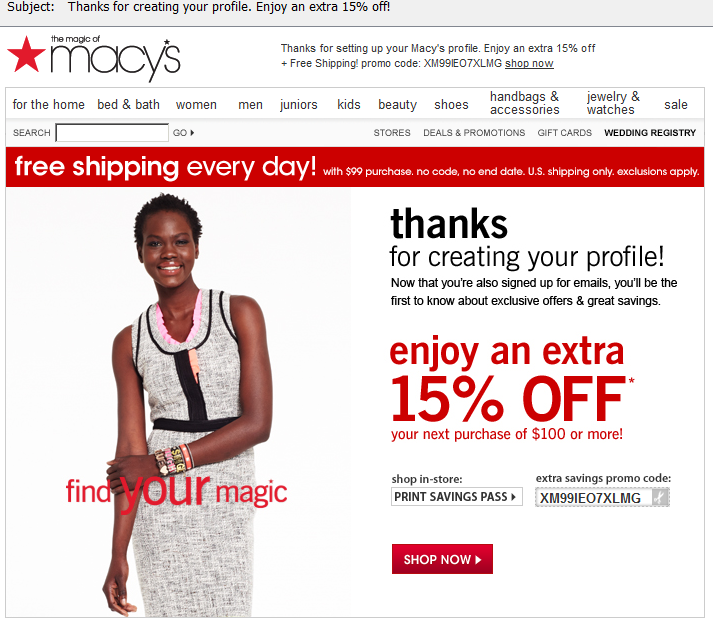 Macy’s also didn’t personalize their subject line or message, but the company does offer a 15 percent off promotion and free shipping. Skechers attracts attention from recipients by personalizing their message, offering a promotional code and featuring a large and bright call-to-action button. 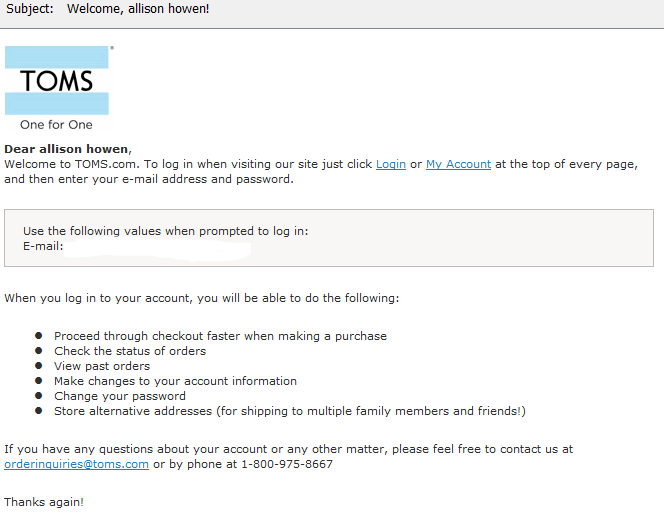 The design of Toms’ email leaves a lot to be desired, however, the company does personalize both the subject line and message of their welcome email. Moreover, the company outlines the benefits of creating an online user account, as well as offers contact information for customer service needs. ShoeDazzle doesn’t mess around with promotions. Not only does this retailer offer the largest welcome discount at 25 percent off, but the company also tells consumers that the discount is only good for a limited amount of time. 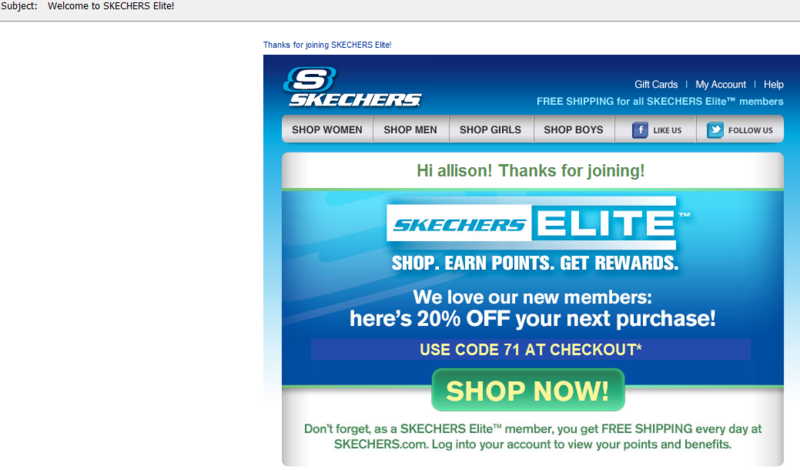 This gives customers a sense of urgency, especially if they are already considering making a purchase from ShoeDazzle. JCPenney’s welcome message takes a similar approach to the aforementioned TOMS. 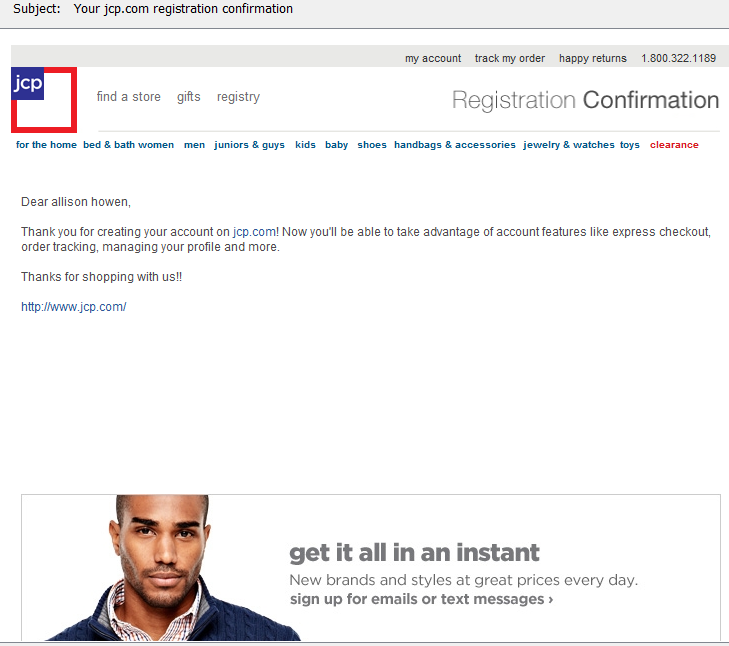 It features a very simple layout, thanks consumers for registering with the company and outlines the benefits of having an account on jcp.com. Steve Madden doesn’t personalize their welcome message, however, the company does thank new subscribers and offers a 10 percent discount for the consumer’s next online purchase. 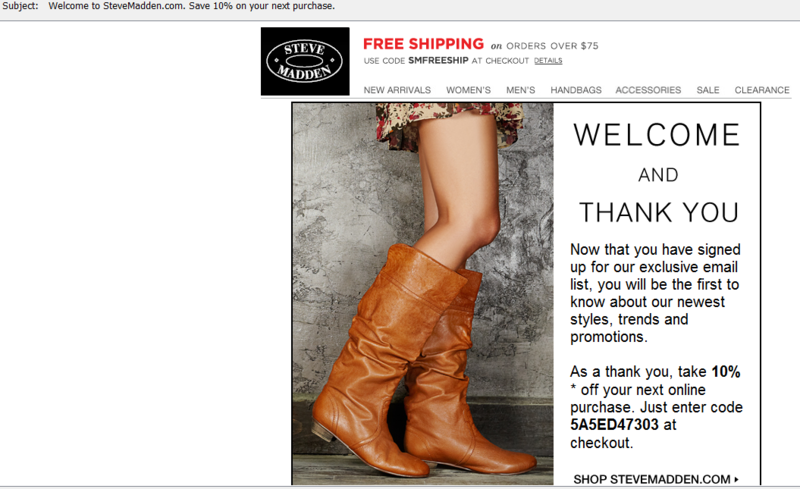 Furthermore, the company tells new subscribers what type of future messages they can expect from Steve Madden. Although I did not receive a welcome message from Overstock.com, I did already receive a retargeting message from the company when I abandoned by shopping cart. However, most consumers will want to be welcomed before they are pushed into the sales cycle. Stay tuned to learn more about Overstock’s retargeting message in next week’s Part 2. After double checking my spam folder, it is safe to say that JustFab has made no attempt to reach out to their new subscriber via email yet.